Mouse gestures are an alternative input method. They are probably best know from web browsers like Opera where they have been available for a very long time. 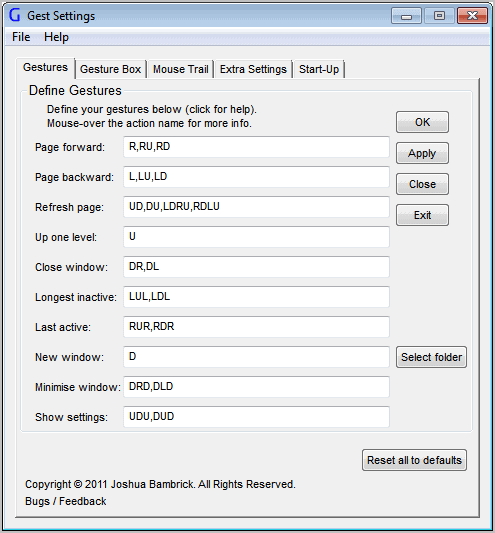 Mouse gestures work by linking the gestures to commands that are executed on the system. Probably the biggest advantage over conventional input methods is the ability to run commands on the computer with minimal efforts. Only one hand is needed and the gestures can usually be drawn at the current position of the mouse cursor. Gest is a specialized portable program for the Windows operating system that adds mouse gesture support to Windows Explorer. The program uses the four directions up, down, left and right to define commands. Several default commands are already configured and ready for use. It is for instance possible to create a new window, close a window or go up one level with some easy mouse gestures. You draw the gesture by holding down the right mouse button and moving the mouse in the directions that the command is associated with. If you wanted to go up on level in the directory structure, you would right-click and move the mouse up. Alternatively, if you wanted to minimize the window you would right-click and then draw down, right and down again to do so. The commands can be customized in the program's settings. You can change the gestures there and for some commands, like the new window command additional parameters. Some commands have two or even more gestures associated with them, so that it is possible to execute the command with one of the available gestures. A small box appears on screen once you start using your mouse in Windows Explorer to draw gestures on the screen. The box displays the directions and acts as a visual aid. It will automatically go away if a gesture has been drawn that is already associated with a command. The program suggests to create a new gesture if it is not know yet. Only the default commands are available for selection for this new gesture. It would have been nice if additional commands would be available, for instance to copy, move or send selected files or to create a new folder. The option to add a new gesture to an existing command can be disabled right in that box. A few other options are available in the program settings. You can change the mouse sensitivity or mouse trail options here, or configure the program to start with the Windows operating system. The recognition rate of the mouse gestures is excellent. Windows users who would like to control some Windows Explorer commands with their mouse can download the latest version of Gest from the developer website. It is compatible with 32-bit and 64-bit editions of Windows 7 and Vista. It has limited support under Windows XP. The developer has published a tutorial on the website that new users can use to learn the program's functionality. I use StrokeIt. Great little piece of software. You failed to mention that Gest is Shareware and after a 60 day ‘trial period’ an Activator must purchased for an unknown amount of money? I does look like its very functional, but I am not about to download it without knowing what it costs. Michael, this caught me off guard. I did not notice any reference of Gest being a paid software during the review. I agree that the developer should reveal those information on the program homepage and display the costs involved in registering the program as well. I actually thought I had updated that page on the website about the cost of Gest but apparently I had not (I have updated it now). The full version of Gest costs $3.99 but you can download Gest (and get all the features for the first 60 days) for free.